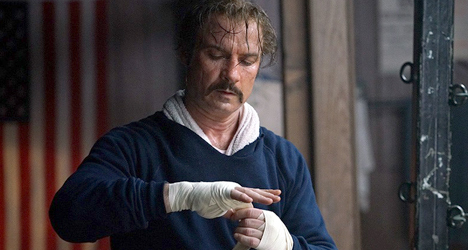 Liev Schreiber stars as boxer Chuck Wepner in the biopic "Chuck." In 1975, boxer Chuck Wepner (Liev Schreiber) gets the opportunity of a life time: to fight the heavyweight champion of the World, Muhammed Ali. As a huge underdog, Wepner goes 15 rounds with Ali and is seconds away from going the distance. This performance turns Wepner into a local folk hero, and Wepner must do all he can to keep his family intact while turning down a path of drugs and women. Without question, “Chuck” serves as a showcase for Schreiber who gives a fantastic performance. Wepner is a character who absorbs and loves the fame, as small scale as it is, but also has an acute awareness of the façade and showmanship that goes into it. Schreiber captures this quite well, especially in scenes where he must work his way through shame and guilt over his behavior. While the supporting cast is mostly good, nobody is on screen long enough to make much of a difference one way or another. Elizabeth Moss is probably the best of the bunch, and far-underutilized. One of the more interesting aspects of “Chuck” is that the most formative event of Wepner’s life is a stepping stone to more story, rather than a climax. Wepner’s famous fight with Ali takes place relatively early on in the film with very little build up. It’s an admirable decision from screenwriters Jeff Feuerzeig and Jerry Stahl to not center the movie around that one big fight, as it may have come off as a biopic version of “Rocky.” Instead, it shows what happened in the wake, and the darker, self-destructive patterns of a man with very little self-control and the need to be admired. That said, the movie still has some pretty generic moments. Once the debauchery starts, it’s no different than any other film where a person of prominence spirals into drugs, lets the fame get the best of them and alienates family. There’s some pretty good writing sprinkled throughout the film and the early parts of the film feature some true greatness. But “Chuck” punches itself out and staggers to the finish. Despite that, “Chuck” is still worth the price of admission for Schreiber’s excellent performance.